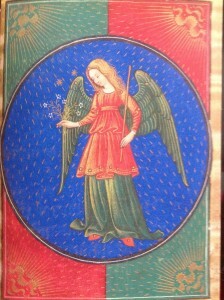 Historically, noblewomen used Books of Hours, beautiful books of prayers, to mark their time. Richly illuminated with pictures of saints, Bible stories, and even signs of the Zodiac, they were sometimes encrusted with jewels. Some called girdle books were small enough to be hung from the waist. Books of Hours contained a calendar, gospel lessons, psalms and special prayers to be said at certain hours of the day: Prime (6am, or upon waking) Terce (9am) Sext (midday) None (3pm) Vespers (6pm) and Compline (9pm, or upon retiring). 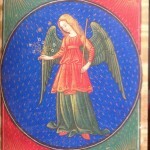 The illustration above is taken from a fifteenth century Book of Hours. She is Virgo (my star sign). I’m going to try the custom of marking my time with a Book of Hours by doing some daily devotional reading. Select your own Book of Hours: a prayer book, a hymnal, a spiritual text, a day book, or even a book of poetry. From this book, choose a short quotation, text or excerpt to use as a daily devotional reading (it only needs to be a few lines long). Or you can simply open your chosen book by chance and read the first section you see. Read your quotation in the morning and again at night. Try this for about a month for the most benefit. If you skip a day, just go back to it the next. Alternatively, try the traditional marking of hours, reading a short text or quotation from your chosen Book of Hours, on the hour, every hour, for a whole day. (We check our phones that often, so why not try this instead!) It might sound arduous, but is found to be relaxing. Build this into a regular practice, or use it as a meditative technique to slow you down when you are feeling particularly rushed or overwhelmed. Marking time with a devotional reading only takes a moment as the clock strikes, but it creates an entirely different sense of time and increases our mindfulness. Our days will feel very different when we mark the golden hours.